soooooooo, something i've not done too much with this house that i've done with the houses in the past is show you what i've done decorating wise or fixing up. um well, here's the deal. its still really plain and in the beginning of things. but our main goal when we moved 3 times this summer was to eliminate extras and eliminate stuff. we wanted to fit in ONE UHAUL TRUCK everything we were going to move on our last move across the plains to our final resting grounds. i am slowly, almost painstakingly slow, deciding on decor and how and what and where things will go. we really are starting all over except for a few core things. 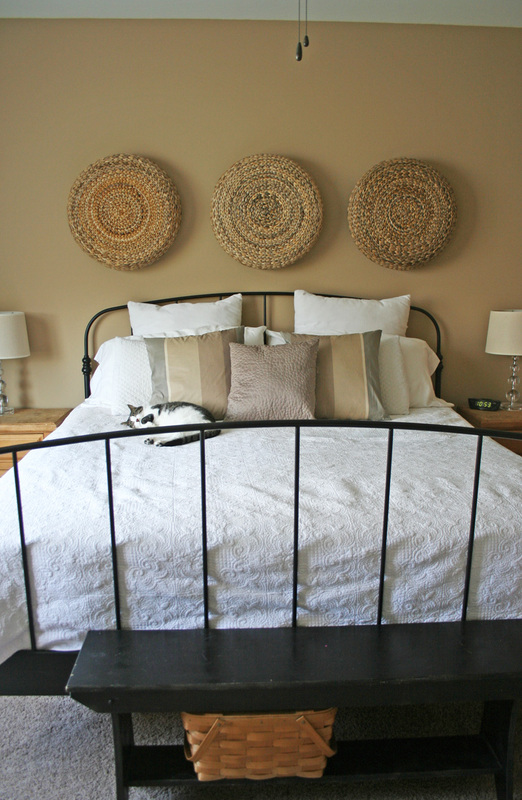 most rooms, like katie's featured here, still need night stands and some kind of shelving. i know what i want, but well, it takes money and planning and finding. i would love built in shelves in all the bedrooms, as this house HAS NO SHELVES ANYWHERE. arrg. <--pirate alert. our bathrooms are the only places where they installed shelves in the closets. if i had unlimited funds i would of already of bought and installed and been done. oh who am i kidding no they wouldn't because i would still be trying to find a better deal somewhere cause that's how i roll. :/ but even without unlimited funds available, i want to find good quality, and if it takes a long time...it takes a long time. for now i am having fun just finding a few core BIG decor things for our walls. our ceilings are really tall and make our walls go on forever. sea salt but only if it looks blue and not green. honestly it will probably not be classic gray. i want that for the boys rooms again. so any suggestions of good grayish blue or beigey gray? 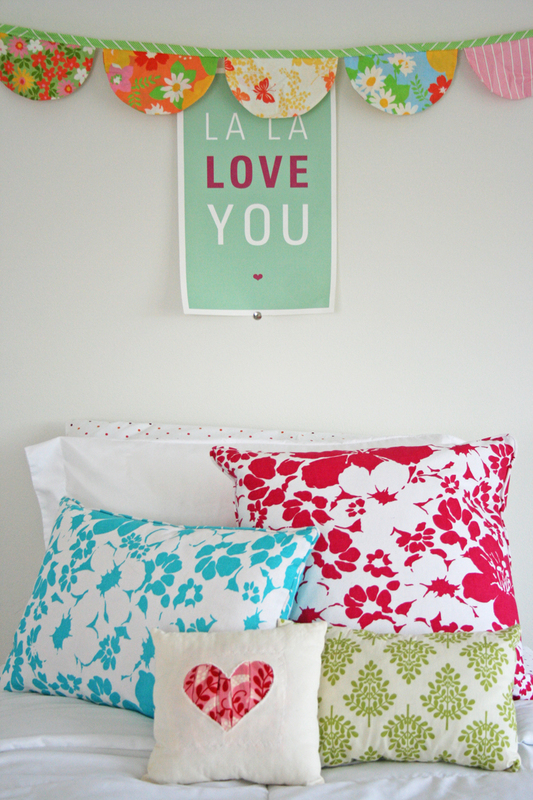 here is where i got my lala love you print. here is where i made the gathered heart pillow. i did buy them before we left utah so i don't know if they still have them. 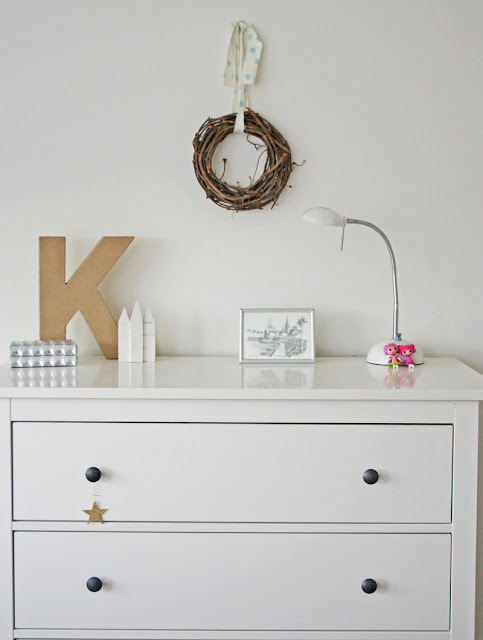 and katie's dresser was ikea as well. the quilt i made, no pattern and yes it still not bound even though i made it like 4 years ago. i'm probably painting this month. probably cause you know life happens. Hi! I love the little wooden temple on Katies dresser..Can I get a 3D? Where did you get it too? Simple and cute!! We just painted our living room Light French Gray by Behr. We actually used Valspar 2000 (not the regular Valspar) because my painter stepdad swears by the stuff and it's only $20/gallon. My salon has Silver Sage by Restoration Hardware on the walls and it's GORGEOUS. All the stylists know the name of it from being asked about the color so many times. :) I'm sure you can have it color-matched - that Restoration Hardware paint is expensive! How fun! To pick colors, not to paint. I bought some paint over 9 months ago and still haven't painted my living room. i love the sea salt color! good luck with all your painting! I just painted my living room a warm taupey gray...greige if you will. It's called Collonade Gray from Sherwin-Williams, and I had it color matched to Behr Premium Paint. I painted my daughter's room "Modern Gray" by Sherwin Williams. It's a beigey gray, but you don't realize it's gray tones for a bit. But it's not too brown. It's very subtle, but it will go with ANYTHING, which is why I went with it, knowing the room will change hands from elementary schooler to baby to toddler with both genders a possibility. And I had picked some grays that kinda turned me off. Got Stonewall Jackson at Menards; sick of it. Also Taupe Tone from Sherwin williams--a mistake. Too dark. It looks rather gray on my wall. Also, as far as shelving goes inside closets, I reccomend trying a Rubbermaid Home Free kit from Lowe's. Once you figure out how the system works (which is pretty easy compared to other stupid closet contraptions), you can buy pieces to complete it or to do a different closet to meet your needs. I bought a different Rubbermaid kit from Menards and it was COMPLETE frustration. I have hated outfitting the closets in shelving, but am not going to compromise again--only using the HomeFree collection throughout the house now. Easily to switch up shelves later if I want. We just used Silver Leaf from Sherwin on our main living area. Love how it turned out! A friend of mine painted her kitchen, dining and living room and up the stairs the relaxed khaki with white trim and it looks lovely. I used the sticks and stones from SW with creamy trim in our dining room, living room and up the stairs...nice neutral, sorta greyish brown. Good luck with your paint selection...yes, it always seems like such a process picking just one color! Your paint colors are fabulous. I am looking forward to seeing your choice. I can so appreciate your California girl lighter colors. I am that way too. I just don't like the dark much. Miss my CA beaches, that is for sure! I'm contemplating paint for the house we're building (did I tell you I know how to frame a house? ), and I'm leaning towards Valspar's Tranquil. It's comes from their independent supplier line that I can get from our local building supply. It's a touch of warm grey. Good luck picking something! i know i painted our master bedroom "rainwashed" (sherwin williams) and it is too bright... despite looking at tons of photos. i do like the classic grey - very soothing. 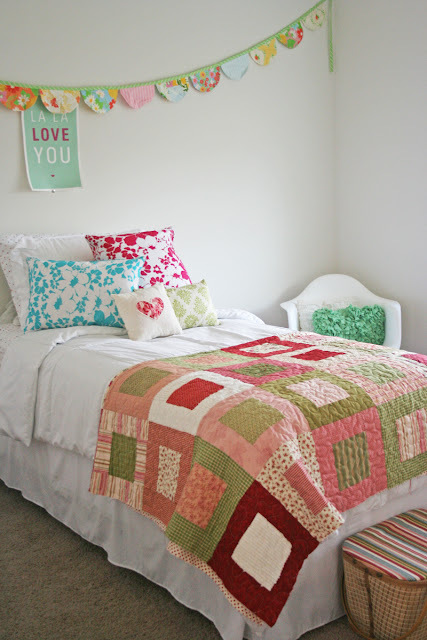 I love two things about this post...1) the quilt still isn't bound and 2) you told us! Oh and 3), jake is feeling better! Just as a sort of random fyi...I painted the relaxed khaki in my last house and certain times of day it would look very peach. I lived with it because it would have been too much difficulty to repaint, but it wasn't my favorite. I love pudding mold. I just had to look at it to see what it looked like and I love it! Sherwin Williams Comfort Gray!!! I stole it from The Nester's front sitting room. It's not gray, it's the perfect subtle aqua and it goes with everything. LOVE IT. We have sea salt in all living areas - it really doesn't have a green look since we have lots of windows and high ceilings - buy a tester & try it in the area of the room that is the darkest. If you have lots of trees, the green reflection will make a difference. We are having our baths (one full and one half) renovated which has given me the opportunity to start over! The small bath is finished and I painted it this weekend. It is Sherwin Williams SW6802 Jacaranda. Sort of a "carolina blue sky" if you have ever been in the Carolinas. Thinking of something greenish in the large bath. Sherwin Williams is great! Just went in and they were really helpful helping me make choices. Highly recommend. I was looking for a grey-blue tone for my living room and picked up a tester of Sea Salt from SW. I thought it looked more green than blue personally. Can you mail paint? I'd send it to you! :) We ended up going with SW Silvermist, which turned out darker than I might have hoped, but it is a nice grey-blue color, I've seen some people cut it with 50% white to lighten it. Misty by SW is my all time favorite colors. I saw it in an issue of BHG. I wanted a gray with a teensy bit of blue. What I got was perfection! Have a gray that I love...it's Martha Stewart chinchilla. And a gray-blue Martha stewart winters day. Site doesn't do it justice but here is the link to winters day. Out of the colors that you posted, I like Pudding Mold, followed closely by Sea Salt; but then I'm a blued gray kinda girl myself. You could always add some dark gray accents. Good luck with the choosing, That always ties me up unto frustration. I have the idea in my mind, but I can't seem to find it exactly. (Too green, too orange, too, too, too...) I may or may not have enough color slips to create my own display. Well, a display that uses my favorite colors but all in similar tones within those colors. Happy New Year to you Vanessa! I love love the first picture, so pretty! My in-laws just painted their living room this color and I love it with the white trim. It's blue/gray. We painted our living room Martha Stewart's Potter's Clay and we love it. I think a lot of how it would turn out would depend on what kind of light it gets, but ours looks mostly grey, with a little bit of those warm earthy undertones. The stress of choosing paint colors makes me get hives. Good luck.